Bidh Camanachd an Òbain an aghaidh Bhaile Ùr an t-Slèibh sa chuairt dheireannaich de Chupa na Camanachd. Chaidh an t-Òban air thoiseach tràth an aghaidh Loch Abair ann an Taigh an Uillt, oidhirp Anndra MhicChuthais a' bualadh air fear de na h-Abraich air an t-slighe dhan lìon. Bha Loch Abar co-ionnan às dèidh 18 mionaidean. Chluich Shaun MacNeacail buille-shaor a-steach dha Ben Delaney. Thionndaidh Delaney gu snasail mus do dhrill e am ball seachad air Stobbart. Bha sin car cruaidh air an Òban, is fhreagair iad gu sgiobalta, MacCuthais le tadhal eile cha-mhòr sa bhad. Bha cothrom air leth aig Loch Abar air an leth-uair. Dh'fheuch Willie Neilson ri stad a chur air Neil Dòmhnallach is e a' dèanamh air an tadhal, agus às dèidh deasbaid eadar na h-oifigich, chaidh slaic-peanais a thoirt dha Loch Abar. Sheall na dealbhan telebhisein gur e co-dhùnadh ceàrr a bha seo, is mar sin 's dòcha gun deach ceartas a dhèanamh nuair a chuir Stobbart stad air oidhirp Delaney. Chaidh an t-Òban nas fhaide air thoiseach tràth san dàrna leth, MacCuthais a' cur a' bhuill a-steach dha Daniel Mac a' Bhiocair, is stiùir esan e seachad air Calum Dòmhnallach. Goirid às dèidh sin bha e 4-1, Daniel Camshron le slaic a bha còir aig an Dòmhnallach a bhith air a stad. Fhuair Delaney tadhal air ais dha Loch Abar ach bha an geama seachad is an t-Òban troimhe 4-2. Bidh iadsan an aghaidh Bhaile Ùr an t-Slèibh sa chuairt dheireannaich sa Ghearasdan air an 17mh den t-Sultain, a' chiad turas aig an Òban sa gheama mhòr bho 2001. Sa Phrìomh Lìog, ghabh Baile Ùr an t-Slèibh ceum eile a dh'ionnsaigh an tìotail le pronnadh 6-0 a thoirt air a' Ghearasdan. Chuir sin cuideachd an Gearasdan sìos gu h-oifigeil dhan Lìog Nàiseanta. Tha obair aig Camanachd an Eilein Sgitheanaich ri dhèanamh gus sin a sheachnadh. Chum Jamie Gannon eadar na puist na Sgitheanaich sa gheama ann an Cill Targhlain, ach mu dheireadh thall chaidh Lòbhat air thoiseach às dèidh 69 mionaidean, Graeme Mac a' Mhaoilein leis an tadhal. Bha na Sgitheanaich co-ionnan le 13 mionaidean air fhàgail le tadhal bho Will Cowie, is dòchas aca air puing co-dhiù, ach thàinig tadhail bho Ghreg MacMhathain is Eòghan Fearghasdan gus an geama a bhuannachadh dha Lòbhat 3-1. Tha còig geamaichean air fhàgail aig na Sgitheanaich is cruaidh-fheum aca air puingean. Tha Ceann Loch Seile san dàrna àite às dèidh dhaibh soirbheachadh 3-0 an aghaidh Ghleann Urchadain. Thàinig na tadhail bho Chèith MacRath, Oliver MacRath is Jordan Friseal. Seile ann an sunnd air thoiseach air cuairt dheireannach Chupa MhicAmhlaidh air an 3mh den t-Sultain. 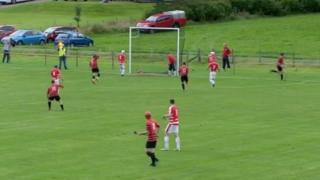 Sa gheama eile sa Phrìomh Lìog chrìochnaich Caol Bhòid gu làidir gus buannachadh 4-2 an aghaidh Cheann a' Ghiuthsaich. San dearbaidh eadar na dàrna sgiobaidhean ann am Port Rìgh ann an Lìog Tuath 1, b' e 4-2 a bh' ann dha na Sgitheanaich an aghaidh Cheann Loch Seile. Ann an Lìog Tuath 3 rinn tadhal tràth bho Dhòmhnall Colville an gnothach 1-0 'son Shrath Spè an aghaidh nan Leòdhasach ann an Siabost. B' e geama cruaidh a bha seo le cuid a bha an làthair den bheachd gun robh pìosan dheth ro chruaidh, ach thill Srath Spè dhachaigh le dà phuing gus an togail os cionn Camanachd Leòdhais. Cluichidh na Leòdhasaich an geama lìge mu dheireadh aca den bhliadhna an aghaidh Inbhir Nis air an 3mh den t-Sultain.